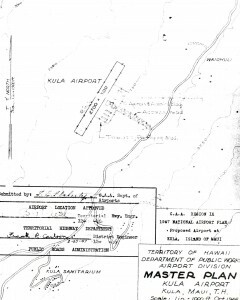 The Superintendent of the Territorial Public Works Department proposed constructing a Class I airport at Kula, Maui. The strip was chosen to encourage inter-island flying by small private and charter planes and to encourage private flying by the residents of Maui. At the time, the only facilities for private flying on Maui were at Maui Airport and Hamoa Airport. The Superintendent believed that if an airport were available it would be put to considerable use by charter operators based in Honolulu. The air shipment of vegetables to Honolulu had already proven practical and profitable and would help move these products from Upcounty Maui to Honolulu. 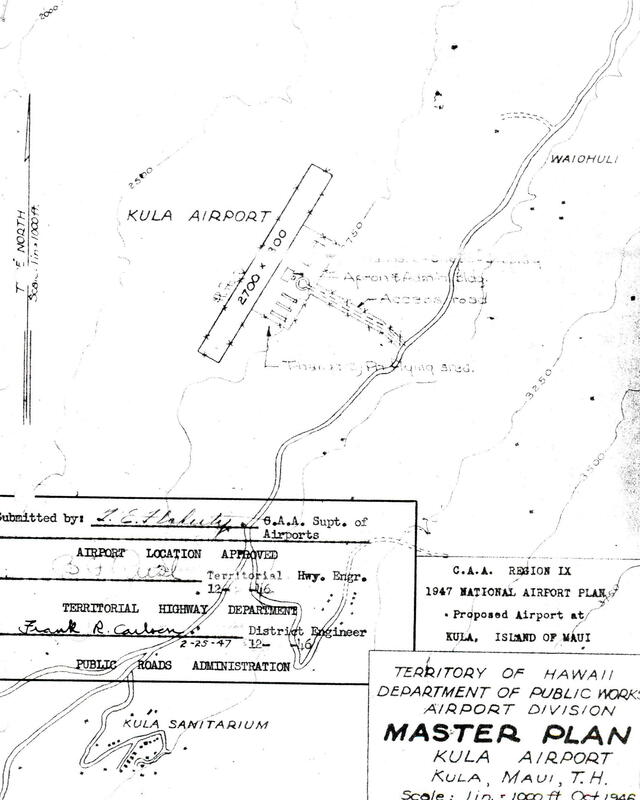 A Master Plan created by the DPW in October 1946 for a proposed Kula Airport, was approved by the CAA Region IX as part of its 1947 National Airport Plan. The master plan called for a 2,700 foot by 300 foot runway, apron and administration building, T-hangars and an access road. The project was not recognized by the Territorial Government in 1947. There was no further mention of the airport.